Long and, accordingly, expensive waiting times for delivery should be avoided. 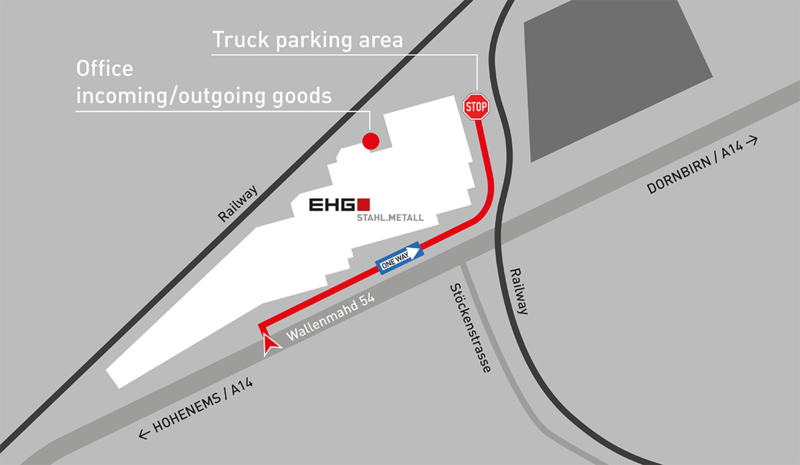 This is why you are required to book a time slot using the cargoclix time slot booking system for unloading your truck at the EHG site in Dornbirn. Without a booked timeslot the unloading might be delayed significantly until the next available time slot. Trucks with a booked time slot enjoy priority handling, resulting in shorter to no waiting times! All other trucks are unloaded in the next free time slot. EUR 0.50 are charged for each time slot booking. There are no further costs. Each booker receives a monthly invoice from our partner CARGOCLIX (Dr. Meier & Schmidt GmbH). If you prefer the time slot to be booked by your logistics services provider, please send them the following link: Cargoclix. Should you have any technical questions regarding the time slot booking system, feel free to directly contact Cargoclix on +49 7233 97480.